The next paragraph will seem strange for an article published during mid-October, because it was first published in January of 2017. However, it is appropriate because the Winter Baetis Hatch has already started as it always does this time of the year, and it will extend through April. It probably seems kind of funny, with all the ice and snow in my front yard here in Steelheadville, that I am banging out an article about dry flies and trout. It is probably below zero on the Missouri, blowing twenty on the Deschutes, and shoreline ice on the Yakima. But, just as sure, there is a pretty girl strolling on tropical sand somewhere, and there are also trout sipping baetis mayflies between the gales. It goes on all winter, whether we are there or not. In my subconscious mind, I had adopted the persona of the heron; still... silent... watching... waiting... alert... but, relaxed. Twenty minutes passed. The natural world forgot I was there. A mink foraged along the opposite bank. A wren fluttered in a bush. A robin proclaimed territorial boundaries with lilting song. The green river flowed relentlessly past, powered by the force of gravity. A tiny black nymph swam to the surface between my submerged wader-covered knees. I scooped it from the water and it struggled in a tiny pool in the palm of my hand. Then a miracle happened. The minuet black creature arched its back and bright green reflective bands appeared at regular intervals along the entire length of the contorting body. It's back split between the bulging wing pads at the back of the thorax. A winged insect pushed itself through the opening. The scene unfolded in slow motion but was over fairly quickly. A tiny iron blue dun mayfly rested lightly on the surface of the puddle in my palm. The dark olive nymphal shroud from which it had emerged, drooped behind it and suspended from the surface film of the water. A baetis mayfly dun slides from the nymphal shuck in water so clear that the surface is barely discernable, but the remnant of the nymph stays submerged, and the air breathing insect crawls out upon the surface. Moments before you would have seen bright green reflective bands caused by large bubbles of gas as they are trapped between the layers of skin as they slide past each other. In the picture above, the dun is nearly free of the shuck, and all the gas has just escaped. Baetis mayflies are an extremely widespread genus. Several species are multi-brooded and may have two or more generations per season. Sizes and colors vary throughout the seasons. Most are tiny and average size #16 to #22. Colors range from tan to olive to gray. Individuals can vary in color during a single hatch. Hatches can occur nearly any time of year. But in the west, winter is baetis time. Nearly every river regardless of type, ranging from tiny spring creeks to giant tail waters, and even highly fluctual steelhead rivers have a winter baetis hatch. The great fly fishing entomologist Rick Hafele, tells us that there are at least five sub-species of baetis that hatch from Oregon's streams and lakes. It was also Rick that had told me about the black nymphs with bright green bands several years before I saw them for myself. His nymph pattern made with a body of twisted peacock color Krystal Flash was a staple at our shop for years, and is still a good one. Here a baetis nymph suspends not far below the surface. Soon a split will form between the wing pads and a dun will force itself through the opening. Rivers such as the Missouri in Montana and Oregon's Deschutes have hatches that start as the water cools in October, then peak in February, and finally taper off in April. This is the best of the off-season dry fly fishing. Because of unpredictable travel conditions, rivers are often deserted of anglers, especially during peak hatch periods, which always include low, heavy cloud cover. A pseudonym that has evolved for baetis is "blue wing olive" and many baetis mayflies are that color combination, but not all. Winter baetis mayflies can be very dark colored, instead of being blue winged olive, most are iron blue duns. They emerge during mid-day, usually around noon. Trout rarely rise to them in fast flows. Instead they station-up in slow eddies or in quiet edge water where duns and emergers collect, and are easy targets. Many nymphs are jet black. As the nymph swims to the surface the adult insect is already separating itself from the inside of the nymphal shuck. Bright green bands form at each abdominal segment. As the skin splits down the back of the head and between the wing pads of the nymph, the dun starts to emerge through this tear. At this point the insect can neither swim nor fly. It is completely helpless and a perfect target. Many emerging insects complete this cycle at the surface, where they are momentarily trapped in the hard film where the water meets the air. Here they linger and are easy picking for feeding fish. And that is what leads to the appeal of baetis hatches: trout station up and pick these tiny insects off as they congregate in the calm edge-water where the fish are visible. So what is the best way to take part in this abundant winter sport? First, check the fishing regulations. Not all rivers are open to trout fishing in the winter time. But many are. On the east side of the Cascades, many parts of the Deschutes River drainage are open year around. In the Willamette Valley, some parts of the Willamette River including the McKenzie, are open. And don't forget, sea run and resident coastal cutthroats eat baetis mayflies. In many cases, baetis hatches are incredibly prolific with insects nearly in mats on the water. At such times, the fish can be very selective, feeding only of cripples, of certain hatch anomalies. It pays to have a selection of flies and it pays to be observant. Carry a pair of small binoculars to observe feeders. You will get some surprises. What kind of tackle do you need to fish the winter baetis hatch? Most of it doesn't have to be very specialized. After a good pair of waders with sufficient layering under them, a waterproof wading jacket and polarized glasses; you will need flies, a leader that is in perfect condition, and spool of 6X fluorocarbon tippet. Just because the flies are small doesn't mean all the fish will be small. Some surprisingly large trout feed on baetis mayflies, especially if conditions are in their favor to consume lots of them. Fishing with a fine tippet can make all the difference between getting lots of hook ups, or none at all. 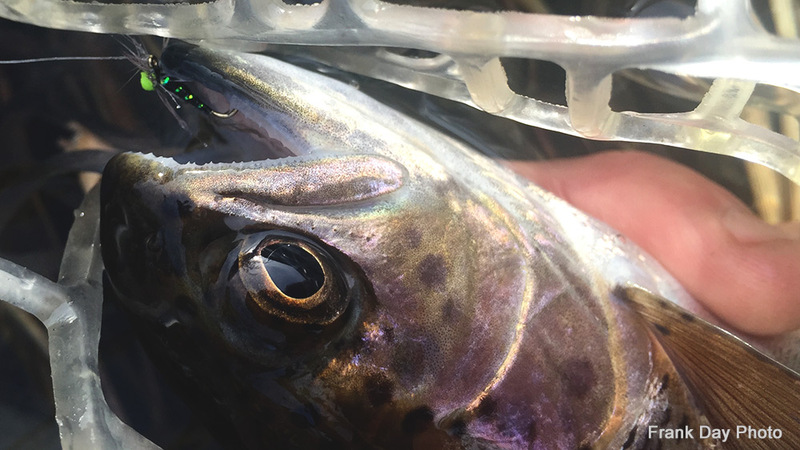 A four pound trout in prime condition is a load for 6X tippet when the leader it is in pristine conditions, add a wind knot or an abrasion and it may be nearly impossible to land. Large fish will nearly all go into your backing if they want too. Having a lightweight rod and a very smooth operating reel is essential for this kind of fishing. Having a reel with heavy drag pressure in this game is of no value. In this arena, smooth is the key word. Your reel needs to be set up with temp-only enough drag pressure so that it won't back-lash and no more. I own a full set of a Abel T/R2 Reels that I have collected over a twenty plus year period, and I cherish every one of them. Another reel that I have used and that is still available is the Hardy Marquis Lightweight. It is made in England, and is the reel Abel copied. It has been around since the 1970's and all the spools and frames from the oldest ones fit the newest ones. The newest version of the Marquis are made from aircraft aluminum alloy, and they are very strong and reliable. My current favorite trout rod is a Sage 590-4 ONE, on it resides my favorite black coral finish T/R2 with the gold spool. The reel has migrated across the reel seats of many rods. Rods come and go as technologies change, but favorite reels tend to last forever. Sadly they are no longer made. In trout reels, simplicity seems to be an endearing trait. My other current great trout rod relationship is with a TFO 590-4 BVK. I bought the rod, reel, and line as a teaching tool, then fell in love with it. It is not expensive or flashy, nor will friends or clients be impressed with me because I own it. I have long since quit caring about things like that anyway, but I really do enjoy the way it casts. And casting it around brings back memories of talking to Lefty Kreh on the phone for long pleasant periods about how it was designed. Finally, I can't forget to mention my TFO 380-4 BVK; an 8' - #3 that was the bane of the small stream trout population around the shop last summer. It will get a workout on a baetis hatch some time before spring, for sure. There are many artificial flies that have been tied to represent baetis mayflies. Some of our favorites are listed below. Or you can buy the complete set: Winter Baetis Equalizer Kit (3-each of the flies above, 15 flies in all). Comes in an attractive, single compartment snap-lid box.